I wanted to take a better photo with my new Sigma lens than my workplace from a distance. So this morning I set out for another High Park visit. This time it was well before sunrise. Alas, things did not go as well as I had envisioned. But I still managed a few keepers for my Toronto, Ontario Flickr album. My goal of sunrise photos was only partially with this shot. The attachment foot to mount the camera or lens on my tripod is too small. It fits the ballhead that I use for the Platypod, but not the ballhead on the tripod. So I had to handhold all photos while still lugging my tripod around with me. 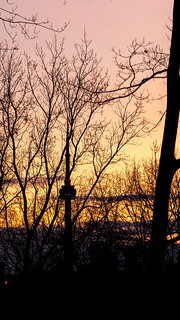 I knew that I wanted to silhouette the tree branches with the sun, but I changed plans slightly when I saw the CN Tower off in the distance. The idea of blending nature’s towers with humankind’s towers appealed to me. Once the dawn had completely broken, I began my trek back toward the subway station. I could hear woodpeckers in the trees, so I figured this would be the best opportunity for the new lens. The handholding made for a less than tack-sharp photo. 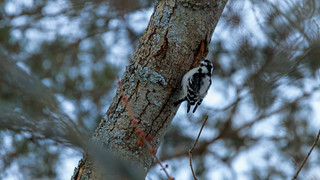 Once I spotted this woodpecker having his breakfast, I managed to zoom all the way out to 600mm and snap this shot. The tripod would have been welcome here, so I definitely need to get the correct attachment feet in my camera so that I can move between the Platypod and the tripod with minimal fuss. A fluid head for the tripod might be a future purchase too. Scroll toward the bottom of the Flickr album to see a few other bird photos taken with the new lens.